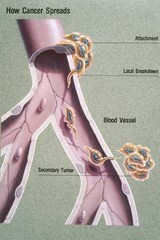 This illustration titled "How Cancer Spreads" explains the process of metastasis. Once metastatic cells are attached to the basement membrane (a physical barrier that seperates tissue components), they break through with the help of an enzyme called type IV collagenase. Cancer cells then move through the blood stream enabling them to spread to other parts of the body. A secondary tumor may form at another site in the body.